A method is described for quantifying the quality of wideband speech codecs. Two parameters are derived from signal-based speech quality model estimations: (i) a wideband equipment impairment factor and (ii) a wideband packet-loss robustness factor . The equipment impairment factor can be combined with impairment factors for other quality degradations to form an estimate of the overall conversational quality of a wideband communication scenario, using a wideband extension of the E-model. The packet-loss robustness factor captures the robustness of the codec against packet-loss degradations. In contrast to past work, these parameters are no longer determined on the basis of auditory test results, but from signal-based speech quality models. We applied three intrusive models to several databases and compared the derived quality estimates and impairment factors to those obtained from auditory tests. The results show that when migrating from narrowband to wideband transmission—a quality improvement of roughly 30% can be obtained, which is very similar to the one observed in auditory tests. The estimated impairment factors show a high correlation to those derived from auditory scores. Congruences and discrepancies to auditory test results are discussed, and an outline of work necessary to set up a wideband or even superwideband E-model is given. where represents the "optimum" Signal-to-Noise Ratio (SNR) in absence of supplementary impairments. represents the impairments occurring simultaneously with the speech signal. encompasses the impairment related to conversational effectiveness, occurring with a delay to the transmitted speech signal. corresponds to the equipment impairment factor introduced by low bit-rate codecs. The expectation factor allows a compensation of the impairment factors in terms of "advantage of access" (e.g., cordless handset). The predicted conversational quality on the -scale ranges from (lowest possible quality) to (best quality) for standard Narrow-Band (NB, Hz) connections. Due to the migration from circuit-switched to packet-switched networks, telephone channels are no longer limited to the standard 300–3400 Hz bandwidth. Instead, WideBand (WB, Hz) speech transmission or even beyond can be provided with minimal additional effort, and a number of such services are currently introduced by telecommunication operators. The increased bandwidth has shown to enhance the perceived quality by around 29% compared to the standard NB channel. The -scale has been extended to for a "direct" WB channel, as it has been shown by Möller et al. and is currently reflected in ITU-T Rec. G.107 . Unfortunately, this enhancement may get lost when the network equipment introduces further degradations. A major part of commonly-observed degradations stems from speech codecs which are necessary to transmit the WB speech signal in an efficient way. The ITU-T currently recommends the ITU-T Rec. G.722 , the ITU-T Rec. G.722.1 , the ITU-T Rec. G.722.2 , the ITU-T Rec. G.729.1 , the ITU-T Rec. G.718  and the ITU-T Rec. G.711.1  for this purpose. Depending on the bit-rate and the coding principle, the degradation associated with each of these codecs may reduce the 29% quality improvement, and consequently lead to a lower quality than a direct channel. The degradations due to WB speech coding are captured by a one-dimensional parameter, called WB equipment impairment factor . The values are defined on the -scale as the difference between the -value corresponding to a codec under study and the -value corresponding to the "direct", clean channel. Möller et al. derived a number of values for G.722, G.722.1 and G.722.2 codecs at different bit-rates. These values have recently been included in Appendix IV to ITU-T Rec. G.113 , either for a monotic or a diotic listening mode (the listening mode has shown impact on the results), as a WB extension to the E-model. where is the "effective" equipment impairment factor including packet loss, is the equipment impairment factor without packet loss, is the percentage of lost packets, and is a factor describing the robustness of the codec against packet loss, in the sense of a lack of audible effects (the higher , the lower the associated audible degradations). Provisional values are listed in ITU-T Rec. G.113 , for a diotic listening mode only. A methodology has been developed by Möller et al. for deriving and values from the results of auditory listening-only tests carried out in accordance with ITU-T Rec. P.800 . This procedure rules out biases which stem from the characteristics of the auditory test, like language, quality range, listener's experience, and so forth. It has been approved as a standard in ITU-T Rec. P.833.1 , and mainly extends the respective procedure of the NB case, see ITU-T Rec. P.833 . The E-model provides estimations of speech quality on the basis of network- and terminal-related parameter values. These values have been measured by different "instrumental" methods, that is, measurement instruments. Thus, all input parameters for a full WB version of the model (which still needs to be developed) should be measurable in a purely instrumental way. For instance, loudness ratings can be measured by a method described in ITU-T Rec. P.79 . In order to derive stable and values, the authors extended the methodology described in ITU-T Rec. P.833.1  using estimations from signal-based speech quality models instead of auditory test results, see Figure 1. (In the literature, the term "objective" is sometimes employed to refer to signal-based speech quality models, and the term "subjective" to refer to both listening-only or conversational tests. For the purpose of this work, we think that the term "instrumental" better describes the framework of measurement methods used to quantify all input parameters of the E-model. In turn, we use the term "auditory" to refer to methods based on the results of listening-only tests.) The resulting methodology has recently been adopted by the ITU-T as the new Recommendation ITU-T Rec. P.834.1 . The present paper aims at evaluating this methodology for different databases and signal-based models. One other method has already been proposed for this purpose: Raja et al. developed a methodology based on network parameter values such as the mean packet loss rate for the instrumental derivation of and values. These parameters are combined using Genetic Programming. In order to evaluate the accuracy of its methodology, Raja et al. compared the derived and values to reference values which have been derived from signal-based speech quality model estimations instead of auditory test results. However, the derived values depend on the reliability of the signal-based model used. Overview of the methodology adopted by the ITU-T and described in ITU-T Rec. P.834.1 . Estimating the input variables for one type of model (parameter-based) with the help of another type of model (signal-based) may be a dangerous undertaking if the consistency with quality values derived from auditory results is not proven. Whereas there are no particular doubts about the feasibility, there are three research questions we would like to answer with this paper. By which amount is the -scale extended when applying instrumental models? Is this amount congruent with the one found in auditory tests? Which values can be obtained with the instrumental approach? Are they comparable to those derived from auditory results? Is it possible to come up with meaningful packet-loss robustness factors via instrumental models, to be used in ( 2 )? Section 2 describes the ITU-T Rec. P.834.1 methodology used to derive the and values from signal-based model estimations. Möller et al. applied the methodology for the quantification of the G.711.1 speech codec using one instrumental model and one speech database. In this paper, the P.834.1 methodology is applied with three signal-based models and seven speech databases which have been collected for different purposes, in different languages. Section 3 briefly reviews the three models. The databases and the processing applied to them is described in Section 4. The models provide us first with an estimation of the quality enhancement when migrating from NB to WB; this enhancement is quantified in Section 5 and compared to the values from auditory tests. Then, using an average value for the enhancement, we applied the P.834.1 methodology and derived values for a range of codecs and bit-rates. The method is analyzed by comparing the values derived from signal-based models to those derived from auditory tests, see Section 6. Finally, we try to estimate values for different packet-loss conditions in Section 7. We conclude in Section 8 with a critical discussion of the proposed methodology and an outlook on work which is still necessary to define a wideband E-model where all input parameters can be derived from purely instrumental measurements. Speech Material. Speech material has to be processed through 12?WB reference speech codecs and the codec under investigation. Additional conditions may be processed such as mixed tandems of the codec under investigation with the reference codecs, or transmission errors possibly concealed by a packet-loss concealment algorithm. Quality Estimations. Each speech file pair is processed by one or several signal-based models. The models provide scores in terms of an average Mean Opinion Score (MOS) value which could have been given by a number of test participants in an auditory test in accordance with ITU-T Rec. P.800  and ITU-T Rec. P.830 . where the "direct" condition is a linear PCM signal quantified with 16 bits per sample. The coefficients and are determined numerically, approximating all the reference wideband codecs in a least-squares sense. So far the derivation of WB packet-loss robustness factors is not described in the ITU-T Rec. P.834.1  methodology. However, we can apply the same method deriving values for each packet-loss condition and then approximating (2) in a least-squares sense, see Section 7. Signal-based models have been used for several decades to estimate the quality degradation associated with codecs, quantizing distortion, as well as frame erasures or packet losses. An overview of different modeling approaches can be found in Rix et al. (e.g., ). The underlying idea of a specific class of such models—the so-called intrusive models—is depicted in Figure 2. They estimate a degradation associated with a specific part of the transmission channel, for example, a coding-decoding process, on the basis of the reference (clean or system input) speech signal and a corresponding degraded (distorted or system output) speech signal . First, and are windowed and filtered to simulate the listening terminal of the user. They are further aligned to rule out effects of delay and jitter (variable delay). Both signals are then transformed to an internal representation, which simulates several characteristics of the peripheral human auditory processing, taking place mainly in the inner ear. The internal representations of the input and output are compared, and a perceptual distance is computed for each signal frame. Finally, the individual distances are averaged and transformed to an estimation of a MOS value, as it would be obtained using a 5-point Absolute Category Rating (ACR) listening quality scale as described in ITU-T Rec. P.800 . 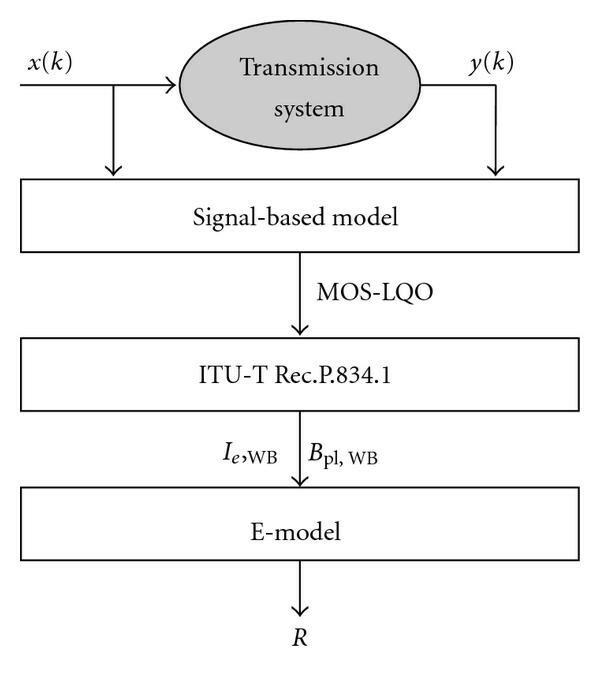 Schematic of a signal-based speech quality model for estimating MOS values. In order to derive and values, wideband signal-based models are required. The procedure used to extend the -scale requires quality estimations in both contexts, NB and mixed-band (i.e., NB and WB). Therefore signal-based models providing quality estimations in both contexts are needed. Only few wideband models are available. The ITU-T currently recommends a wideband version of its Perceptual Evaluation of Speech Quality (WB-PESQ, see ITU-T Rec. P.862.2  and ITU-T Rec. P.862.2 ) for this purpose. However, the WB-PESQ shows several limitations. Therefore, a modified version of this model, described by Côté et al. , has been used to better cope with the characteristics of wideband speech codecs. Another model providing estimations in both contexts has been used for some years, namely the Telekom Objective Speech Quality Assessment (TOSQA) model developed by Berger , and its wideband version, TOSQA-2001 . Characteristics of the three models are briefly discussed in the following subsections. 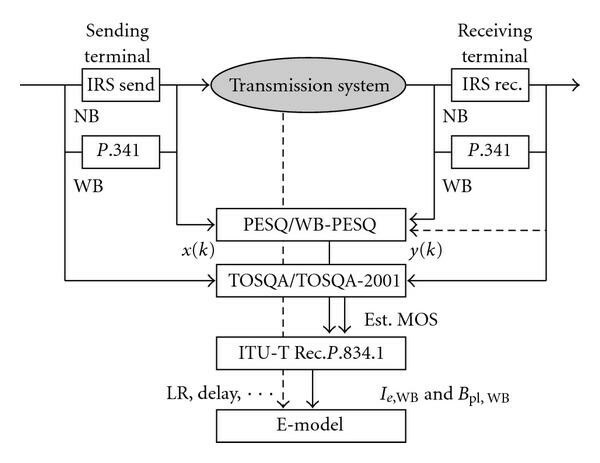 The PESQ model is based on its predecessor PSQM  and the variable delay estimation provided by PAMS ; it is currently recommended by ITU-T for assessing the impact of speech codecs, including the effects of frame or packet loss . The model follows the structure of Figure 2. As the sending device, the model assumes a standard handset which is commonly simulated by a modified Intermediate Reference System (IRS) sending filter according to ITU-T Rec. P.830 . For simulating the receiving device which would be used for listening to the speech in an auditory test, the model assumes an IRS receive filter according to ITU-T Rec. P.48 . The receive filter is applied to the signals and in the preprocessing step, because the model is usually applied to the electrical part of the network, before the receiving terminal. In addition, effects of linear distortion are partly ruled out in this step. Input and output signals are then aligned using the algorithm described by Rix et al. , taking also care of time-varying delays introduced by variable-length jitter buffers. The internal representation follows the algorithm developed by Beerends et al. and deviates from standard loudness models by calculating a so-called "compressed loudness", which is in contrast to psychoacoustic findings, but provides a higher correlation with auditory test results. The averaging step shows three particularities: it includes a measure of the noise disturbance during silent intervals, it considers time-domain masking, as well as an asymmetry of perceptual degradations due to omitted compared to newly-introduced signal components. The averaged distance is finally transformed to the MOS scale using the mapping function given in ITU-T Rec. P.862.1 . The algorithm of WB-PESQ is identical to the one of PESQ for NB speech, except in two points: (i) the input filter in the preprocessing step of WB-PESQ has a flat passband characteristic 100–8000 Hz  instead of the IRS receive high-pass characteristic used in PESQ; (ii) the mapping function differs for WB transmissions and is provided in ITU-T Rec. P.862.2 . It should be noted that the MOS value estimated with WB-PESQ cannot be directly compared to the one obtained with (NB-) PESQ, since NB conditions are usually rated worse in a mixed (NB and WB) context than they are rated in a purely NB context. Work on the relationship between the use of the MOS scale in NB, mixed NB/WB, WB and even super-WB contexts—both in auditory tests and in instrumental models—is currently underway in ITU-T Study Group 12. Although WB-PESQ is widely used for estimating the impact of wideband speech codecs, it has shown some deficiencies in estimating the quality with particular types of codecs [23, 33] and for speech with an intermediate (between NB and WB) bandwidth. In order to increase the prediction performance for wideband speech codecs and to rule out some talker dependencies, a modification was proposed by Côté et al. by adding a 50–7000 Hz bandpass filter to the preprocessing step (see ), by applying a slightly different compensation of the linear distortion, and by reducing the impact of low-frequency distortions via a frequency-bin weighting in the internal representation. These modifications have shown to increase the prediction performance for a small set of databases, in terms of a higher Pearson correlation coefficient and a lower root mean square prediction error between the auditory and the estimated MOS ratings. This version of PESQ and WB-PESQ will be called "Modified PESQ" and "Modified WB-PESQ" in the following analysis. In contrast to PESQ, TOSQA calculates a similarity (correlation) instead of a distance between and . Both signals are prefiltered and time-aligned, however using a variable delay estimation on the basis of a maximum correlation between input and output frames. Effects of linear distortions are compensated for, except for low and high frequency signal components. Because the model may also be applied to the acoustic signals available at the sending and receiving terminals, the input signal is additionally filtered with a modified IRS sending characteristic. Both and are further filtered by a standard 300–3400 Hz bandpass filter to simulate the receiving terminal. The internal representation is based on Zwicker's loudness model , without modifying the standard loudness compression laws. Finally, a third-order mapping function is provided to map the raw TOSQA score to the MOS scale. A detailed description of TOSQA can be found in Berger . The so-called "2001 version" of TOSQA has been extended and improved by a dynamic gain alignment, an adaptive threshold for the internal voice activity detection (VAD), and a modified background noise calculation which takes into account comfort noise introduced by VADs in the network or in the terminal. The model has been adapted to wideband transmission by using a 200–7000 Hz passband filter instead of the IRS receive filter, and replacing the modified IRS sending characteristics applied to by a flat filter. In this way, it has been shown to provide acceptable correlations with acoustically-recorded speech samples, including the effect of the transmitting and receiving terminal [25, 36]. In order to instrumentally calculate the quality improvement when migrating from NB to WB transmission scenarios and the effective equipment impairment factors for WB speech codecs, databases consisting of input and corresponding output signals of NB- and WB-transmitted speech are necessary. The databases used in this study are listed in Section 4.1. They have been processed with the WB-PESQ, the Modified WB-PESQ and the TOSQA-2001 models in order to estimate MOS values for each input-output signal pair. The processing steps are described in Section 4.2. As auditory MOS ratings are available for all our databases, the prediction accuracy of the three instrumental models—in terms of correlations and prediction errors of the auditory and estimated MOS scores—is analyzed in Section 4.3. Seven databases obtained from 25 auditory tests are available for our study. They are summarized in Table 1 and described in the following paragraphs. Processing conditions included in the seven databases. PL refers to packet-loss conditions, BP to bandpass filtering and TD to tandeming of speech codecs. G.729EV refers to the prepublished version of the ITU-T Rec. G.729.1  standard. Stems from a pair of listening-only tests carried out at France Télécom R&D (Lannion, France) in 2004 by Barriac et al. . The NB test includes 18 NB conditions (i.e., standard speech codecs such as G.726 and G.729) and 7 WB conditions downsampled to a sampling rate of 8 kHz. The mixed-band (NB/WB) test comprises the 25 NB conditions included in the NB test and 11 WB conditions (the G.722, the G.722.1 and the G.722.2 speech codecs). The direct WB condition corresponds to a flat lowpass ranging from 0 to 8 kHz. Contains stimuli from a pair of two listening-only tests carried out at the Institut für Kommunikationsakustik (Bochum, Germany) [11, 38] in 2005. The NB test includes 4 bandpass filtering and 5 speech codecs (e.g., G.711, G.726 and G.729A). The mixed-band (NB/WB) test includes the 9 NB conditions included in the NB test and also 9 WB conditions (bandpass filtering and 2 WB speech codecs). The bandpass filtering conditions have different bandwidths (lower cut-off frequency Hz, upper cut-off frequency Hz). Originates from a test carried out at Institute of Information Sciences and Electronics (Tsukuba, Japan) in the Japanese language and includes both NB- and WB-coded samples, with and without packet loss. Details on the test set-up are described in . Was obtained from NTT (Tokyo, Japan), see Takahashi et al. . It includes both NB- and WB-coded samples in error-free and packet-loss conditions. Was processed at France Télécom R&D (Lannion, France) in 2006  and consists of two tests with NB- or WB-coded samples, with and without packet loss. The NB test includes several speech codecs (e.g., G.711, G.729, G.723.1 and AMR). The NB/WB test is composed of the 30 NB conditions included in NB test and 30 WB conditions including several speech codecs (G.722, G.722.1, G.722.2 and G.729EV2. (The G.729EV corresponds to a prepublished version (Version 1.14.1 – Jan. 31, 2006) of the ITU-T Rec. G.729.1  standard. This version has been used during the optimisation/characterization phase.) Both listening-only tests include speech codecs in single and tandem conditions at different packet-loss ratios (0%, 3%, 5% and 10%). Is provided in ITU-T Suppl. 23 to P-Series Rec. and stems from the ITU-T Rec. G.729 (8 kbit/s) codec selection phase. It includes 2 ACR listening-only tests (Test 1 and Test 3), carried out in 3 languages for Test 1 and 4 languages for Test 3. This database is considered as the reference database for PESQ to verify correctness of the implementation, (cf. ). Test 1 includes several speech codecs (G.711, G.726, G.729 and GSM-FR) in single and tandem conditions. Test 3 includes a set of NB speech codecs impaired by transmission errors (packet-loss ratios of 0%, 3% and 5%) and background noise. Originates from the qualification (or selection) phase of the ITU-T Rec. G.729.1 codec. Unfortunately, no speech files are available from the corresponding 10 tests, but only the MOS estimations provided by WB-PESQ, using the transformation according to . Each NB/WB test includes NB and WB speech codecs (G.729A, G.722 and G.722.2), several Narrow-, Middle- (i.e., Hz) and Wide-band MNRU conditions and one of the five candidate codecs at different bit-rates. Details on the test set-up are available in  and on the test results in . Möller et al. already used Databases 1–4 for deriving the -scale extension and values from auditory tests. The other databases of that exercise stem from the G.722.2 characterization phase and could unfortunately not be used in this study, because of legal restrictions. Wideband equipment impairment factors and a future WB E-model shall describe networks in which both NB and WB connections coexist for a certain period of time. Thus, we assume that at least one of the terminals provides WB capability. In such networks, the WB-PESQ model is usually applied to the electric part of the network, excluding the terminals. In turn, TOSQA-2001 can also be applied to the acoustic interfaces. Figure 3 (solid lines) depicts the situation. Scenarios for using signal-based models estimating the quality degradation due to codec and frame/packet loss in a network. However, the auditory results used in our study stem from stimuli where both sending and receiving terminals have been simulated. Such stimuli provide a realistic impression to the test participants. Thus, the output signal is usually filtered, either with an IRS receive type characteristic (NB case) or with a bandpass filter according to ITU-T Rec. P.341 . Because of this, we have to use these "filtered" signals as an input to all signal-based models. This situation is depicted via the dashed line in Figure 3. As auditory MOS values are available for our databases, we can verify the prediction accuracy of each model for these databases, which is a first requirement for the normalization procedure described in this paper. We applied WB-PESQ, Modified WB-PESQ and TOSQA-2001 to the WB and the mixed NB/WB databases, and PESQ, Modified PESQ and TOSQA to the databases for which we have results from a NB auditory test available. In order to quantify the reliability of each signal-based model, a third-order polynomial mapping function has been applied to the estimated MOS values. This mapping function attenuates the impact of the test corpus on the subjective judgments (so-called "corpus effect"), and it is commonly applied to compare results of subjective tests to the estimations of signal-based models. The third oder mapping function is used only for analyzing the reliability of the signal-based models themselves; in the remaining of this article, the raw estimated MOS values have been used for the instrumental derivation of equipment impairment factors, as subjective scores will usually not be available, and thus no corpus effects will occur. The Pearson correlation coefficients and the root mean square prediction errors are listed in Tables 2 and 3. Pearson correlation coefficients and root mean square prediction errors between the auditory and the estimated MOS for Databases 1–5 and 7, using different WB signal-based models. These measures are computed after third-order mapping. Database 7: Letters specify the combination of the test laboratory (A–E, first letter) and the tested candidate codec (A–E, second letter). Pearson correlation coefficients and root mean square prediction errors between auditory and estimated MOS values values for Databases 1-2 and 5-6, using different NB signal-based models. These measures are computed after third-order mapping. Database 6: numbers specify Test 1 and Test 3. The results in Table 2 show that both WB-PESQ and the Modified WB-PESQ reach correlations higher or equal to on all databases except on Database 2, and on some parts of Database 7 (for WB-PESQ). The modified version usually reaches higher correlation values and lower prediction errors. For Database 2, the low correlation seems to be linked to the NB stimuli; the correlations for the NB stimuli of that database alone are significantly lower for WB-PESQ and modified WB-PESQ. The correlations of the corresponding (NB-) PESQ model is also very low on these NB stimuli, cf. Table 3. TOSQA-2001 usually shows lower correlations than the other two models, and it has the same problems with Database 2. However, its NB version TOSQA reaches a high correlation on the NB part of this database. Overall, the prediction accuracy seems to be in the range of what is expected from the figures given in (e.g., ), stating an average correlation of between auditory MOS values and PESQ estimations in NB conditions. For a NB context, an S-shaped relationship is defined between the -scale (range ) and MOS ratings (range ); see . For a WB or a mixed NB/WB context, the -scale can be extended in a way which leaves the NB-use of the scale unaffected. Möller et al. based such an extension on pairs of auditory tests in which the same NB test stimuli have been judged once in a purely NB and once in a mixed NB/WB context, thus quantifying the so-called corpus effect which arises from the two listening contexts. The judgments on these common stimuli define a relationship between the use of the MOS-scale in a NB and in a mixed NB/WB context. On the basis of the auditory MOS values of Databases 1 and 2, an average extension of the -scale of around 29% was derived. The exact values differed between 24 and 31% for these two databases, and between 12 and 42% for a set of other databases found in the literature. In this section, we will try to estimate the value of such an extension on the basis of the signal-based models described in the previous section. The procedure we applied follows as far as possible the one used for the auditory test results , however replacing the auditory test with mixed NB/WB conditions by WB-PESQ, Modified WB-PESQ or TOSQA-2001 estimations, and the auditory test with NB conditions by using the corresponding PESQ, Modified PESQ or TOSQA estimations. The two operational modes should reproduce the corpus effect observable in the auditory tests. As only WB-PESQ scores are available for Database 7, we can apply this procedure only to Databases 1–6. (Database 6 contains all 1738 stimuli of ITU-T Suppl. 23 to P-Series Rec. , including those of the Degradation Category Rating (DCR) session which are not listed in Table 2 because our instrumental models are trained to provide ACR, not DCR estimations.) The MOS estimations of the models first have to be transformed to the -scale. As no relationship between MOS and is defined for a NB/WB context, the fixed relationship given in  has been used. As an example, the resulting (NB model estimates) and (WB model estimates) values for the NB conditions of Database 6, Test 3—calculated by the original/modified WB-PESQ and PESQ, respectively—are displayed in Figure 4. The -value corresponding to indicates the amount by which the -scale has to be extended in a NB/WB context in order to be still valid in the NB case. 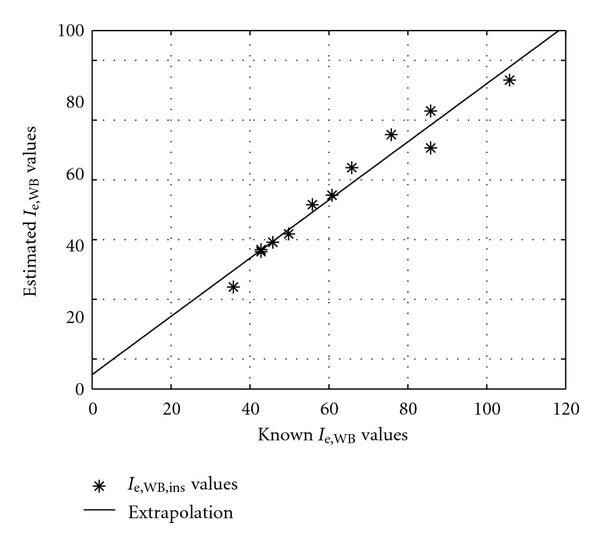 As an example, the extrapolations for Database 6, Test 3 are presented in Figure 4, and the averaged values for Databases 1–6 are listed in Table 4. Average maximum values derived with different signal-based models for Databases 1–6, using different fitting functions, and corresponding root mean square errors . Depending on the model and the database used for its derivation, the maximum on the extended -scale ( ) values and root mean square errors ( ) vary. The best fitting function for all three models—in the sense of a minimum —is (7). However, both WB-PESQ and TOSQA-2001 models estimate a relatively low value. We assume that these two models underestimate the quality of NB conditions in a mixed-band context. As a matter of fact, WB-PESQ is not recommended for estimating the quality of NB conditions in the latest version of the application guide of the model given in ITU-T Rec. P.862.3 . Thus, we think that the low values are mainly due to underestimations of the model, and that the real value is closer to the estimations by (6) and (8). The modified version of WB-PESQ is apparently better in predicting the respective extension also using (7). In addition, Figure 4 shows that the exponential functions sometimes have a very small curvature and are quasilinear. On an average of all models, fitting functions and databases, the procedure leads to , that is, a roughly 30% extension of the -scale when migrating from NB to WB. Interestingly, this figure is very similar to the 29% extension found by Möller et al. for auditory tests, in particular when considering that 4 new databases have been used in the derivation here. The spread of the values found for the individual models and databases ( ) is higher than the values reported in  (12–42%), which is due to the inclusion of new databases. Still, it can be concluded that the extension of the -scale based on our 3 signal-based models leads to approximately the same extension of the -scale than it was observed from the auditory data. Comparing the 30% extension found here to the literature, Raja et al. found an extension of 7% with the WB-PESQ model. The authors used a linear equation following (6) where the extrapolated line is not forced to go through the origin. The obtained parameters were and , that is, a high value for the axis crossing. Using a linear relationship forced to go through the origin as (6), a significantly higher would probably have been found. For transforming MOS values to the expanded -scale in the reminder of the paper, we will use the existing relationship between MOS and defined with the E-model in , and then multiply the resulting with 1.29. This procedure is identical to the one used by Möller et al. (linear expansion). We applied this procedure to Databases 1–5 and Database 7 (for WB-PESQ only), Database 6 containing only NB conditions. Figure 5 shows an example of a normalization procedure for Database 1. It shows the known values and the values derived from Modified WB-PESQ estimations. Exemplary normalization procedure for Database 1 with known and values derived from Modified WB-PESQ estimations. Table 5 gives an example of the individual values which are obtained from WB-PESQ estimations. Table 6 lists the average values for the WB codecs using all three signal-based models, as well as the average values obtained using the methodology of  and the auditory MOS values for the same databases. Impairment factor values for WB and NB speech codecs, derived on the basis of WB-PESQ estimations. Values in the last column have been calculated according to (10) using the defined values of ITU-T Rec. G.113 . Average impairment factor values for WB and NB speech codecs, derived using different signal-based models and auditory tests. Values in the column "Audit. test" have been calculated from the auditory results of the same databases, and values in the last column have been calculated according to (10) using the defined values of ITU-T Rec. G.113 . An inspection of Table 5 shows that there is a spread in the values derived by WB-PESQ from different databases. The same holds true for the estimations from the Modified WB-PESQ and the TOSQA-2001 models which are not reproduced here, in order to save space. The spread is due to the different voices and sentences used in each database, as well as to slight differences in the basic quality (slight noise floor and filtering differences). It is slightly smaller than the spread observed in the values derived from auditory values in . As mentioned in Section 4.3, the auditory test results are influenced by the corpus effect. Therefore, even though a normalization procedure is applied, the values derived from auditory test results still slightly reflect the differences in the judgments of different test corpora. This effect is ruled out by the instrumental model, leading to a smaller spread in the estimations. However, this does not imply any superiority of the instrumental approach: as the instrumental models only aim to predict what would have been observed in an auditory test, the latter can still be regarded as the reference for our approach. In some cases, the normalization step (Section 2, point 5) results in negative values. The corresponding test conditions apparently show a very high rating compared to the other conditions of that database. Still, we prefer to keep the normalization step in order to bring the values in line with the values known for the NB codecs, so that the principle is equally applicable to both NB and WB channels. The last column of Table 5 shows that this target is generally met by our methodology. Table 6 shows that the normalization step leads to averaged values for the NB conditions estimated with all three instrumental models which are close to those obtained from the auditory tests. this results in a correlation with the three model averages of ( ). The overall range of these correlations shows that—on an average— values can quite reliably be estimated with the instrumental approach. However, there are significant differences between the estimations of individual models. First, a shift of about 21 units can be observed for of WB codecs between the WB-PESQ and its modified version. We think that the modified frequency compensation of Modified WB-PESQ leads to an over-estimation of the noise floor degradation for the NB conditions. The latter are normalized to the defined values in step (5), which leads to the observed shift for the WB conditions, and a particularly low value ( ) for the "direct" WB channel. Still, the correlation between values derived from auditory scores and model estimations is higher than the one of the original WB-PESQ model. Overall, the values derived from WB-PESQ are consistently higher than those found in  for all WB codecs (except for the "direct" channel, due to the normalization). When decreasing the bit-rate, the order of values for each codec follows the one of the defined values. The same can be observed for the other two models: with very few exceptions, the order of degradations associated with codec variants of the same family is mainly predicted by the models. The exceptions are due to the fact that not all bit-rates were included in all tests; as a consequence, some of the values are based on one or two databases only. These exceptions are a strong limitation of the presented method. The derived values should be stable over the different databases and thus values based on one database only should have the same accuracy as values based on many databases. This is not the case in Table 5, due to the different number and type of codecs included in each test corpus. Therefore,  recommends to include a minimum of 12 reference codecs in such calculations in order to derive stable values. Unfortunately, the relationships between for codecs from different families is not necessarily reflected in the estimations, see Table 6. Thus, the procedure may be used for establishing a quality relationship between different codec versions (corresponding to different bit-rates) of the same codec family, but not necessarily to compare the quality of different codecs belonging to different families. This is an important finding which limits the applicability of the derivation procedure. The overall magnitude of values derived with the help of TOSQA-2001 seems to be best in line with the auditory method. In turn, the prediction error is slightly smaller with Modified WB-PESQ. By averaging the three model estimates, quite reliable estimates of for WB codecs can be obtained. The corresponding values for the NB codecs show that the methodology produces values which are well in line with the impairment factors of the current E-model. Wideband speech codecs will frequently be used in packet-based networks, and as a consequence packet loss will be effective, either by packets not arriving at all at the receiver side, or by packets which have to be discarded by the receiving jitter buffer because they arrive too late. Databases 1, 3, 4, and 5 contain stimuli where random packet loss has been simulated, using the model given in . These samples have been analyzed with the three signal-based models, and values to be used in (2) have been calculated by minimizing the mean squared error between the curve of (2) and the data points. In this case, values are limited to 0 to avoid strong negative values. Figure 6 presents the values derived from the 3 model estimations for an example codec included in Database 5. The relationships according to (2), estimated for each model, are presented as lines in this figure. Table 7 lists the obtained values and compares them to the values derived from auditory scores following the same procedure. Each value is estimated using 4 or 5 packet-loss conditions ( / ) and then averaged over 1 to 3 databases. Packet-loss robustness factors derived from Databases 1, 3, 4, and 5 (random packet losses). Conditions refers to the number of packet-loss conditions used to derive the parameters. values derived from the 3 signal-based models and the auditory experiment for G. 722.2 at 8.85 kbit/s. Especially the latter model seems to be adequate for the instrumental procedure deriving packet-loss robustness factors, for a later use with the E-model. However, the correlation for the WB-PESQ model increases to without the two FT candidate codec conditions. We described a method for deriving equipment impairment factors and packet-loss robustness factors for wideband speech codecs. In order to avoid costly and time-consuming tests, and in order to be in line with corresponding methods available for NB codecs , the employed method is based on the estimations of signal-based models. The derived values can be used in conjunction with a future WB extension of the E-model, in order to plan future mixed NB/WB networks. The method we applied has recently been approved by Study Group 12 of the ITU-T as a new ITU-T Rec. P.834.1 , see also , emphasizing the need for such a standardized method to determine wideband speech codec degradations. Our work was guided by three research questions which can be answered for the instrumental models and databases used here. When migrating from NB to WB, we found that the extension to be made to the NB -scale is around 30%, which is very similar to the value found with auditory tests. Thus, both auditory and instrumental methods make use of the same scale range. This is an important prerequisite for deriving input parameters to the E-model with the help of both—auditory and instrumental—methods. The values derived with our three models—WB-PESQ, Modified WB-PESQ and TOSQA-2001—are generally in line with those derived from auditory scores, with an overall correlation of between and . Best estimates can be obtained not from the current ITU-T standard WB-PESQ, but from a simple modification of it, or from TOSQA-2001. When averaging the three model estimates, the correlation increases slightly, showing that a combination of models is able to rule out some of the insufficiencies associated with individual models. With few exceptions, the models are able to predict the degradations associated with different bit-rates of the same codec family in the right order. However, the models are not always able to predict the relationship of degradations associated with codecs of different families in the right way. Applying the method further to derive packet-loss robustness factors leads in many cases to meaningful predictions, but not for all models. Whereas the Modified WB-PESQ and to a smaller extend also the unmodified version of this model provide a reasonable estimation of the codec robustness, TOSQA-2001 mainly over-estimates . The observed correlation coefficients lead us to the conclusion that signal-based models are useful for estimating meaningful and values as an input to the E-model. A rough estimate of for individual codecs can be obtained with Modified WB-PESQ or TOSQA-2001, or by averaging different model estimates. Still, the predictions should be used with some care when ordering different codec families with respect to their impact on overall mouth-to-ear quality. However, using the right model, a prediction of the impact of codec bit-rate within one codec family can be made in most cases. Further work is necessary to better quantify the quality impact of codec tandems. 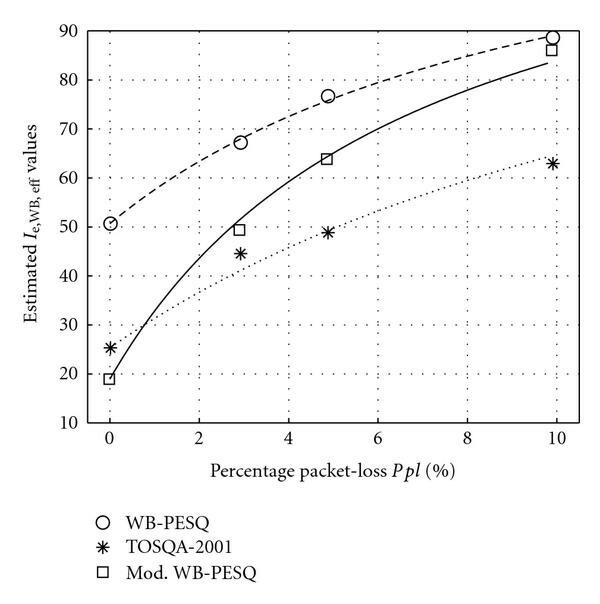 Estimating the robustness of a particular codec towards packet-loss is possible for most codec families, using, for example, the modified version of WB-PESQ. For , averaging of different models slightly increases the prediction accuracy. We further expect that the method proposed here will provide better results when a better signal-based speech quality model becomes available. Such a model should especially focus on the relationship of degradations introduced by different types of codecs. In addition, it needs to validly estimate the impact of packet losses, which seems to be underestimated by some of the currently available models. A new signal-based model which might be used for this purpose is underway in ITU-T Study Group 12. This future recommended model will provide quality estimations in a super-wideband (S-WB) context, that is, Hz. We assume that the methodology described here and recommended in  is still valid using signal-based models providing quality estimations in such a context, but this aspect needs further experimental validation. As soon as better instrumental models for estimating codec and packet-loss impact become available, the method described here can be reassessed in the light of the new results. In addition, the stability of the normalized values depends on the number of values defined in ITU-T Rec. G.113 . Therefore, the normalization procedure may benefit of more values being available. Recently, values for the ITU-T Rec. G.711.1  speech codec have been defined in ITU-T Rec. G.113 . Still, more reference values for further wideband speech codecs would definitely be desirable. Apart from codec and packet loss, other degradations need to be taken into account by a future WB E-model as well. For example, speech level  has proven to be different for NB and WB transmission in some preliminary studies. Besides degradations affecting the listening-only situation, the conversational impact of talker echo and delay needs to be modeled. In this way, a complete WB version of the E-model can be set up, and first steps are already documented by Raake et al. . The method described in this paper will be very helpful in order to guarantee that the final model is fully based on input parameters which can be derived from instrumental models, without a further need for auditory tests to specify the parameters. The present work has been performed in a collaboration between Deutsche Telekom Laboratories (TU Berlin, Germany), France Télécom R&D (Lannion, France), the University of Tsukuba (Japan), and the NTT Service Integration Laboratories (Tokyo, Japan). It was partly supported by the German Research Fund (DFG) under the project MO-1038/5-2. It was also partly supported by the Strategic Information and Communications R&D Promotion Programme (SCOPE) in Japan under the project 073103002. The authors would like to thank all involved organizations for their support, as well as T-Systems Enterprise Services GmbH, Berlin (Mr. H. Klaus), for providing the TOSQA model, and the three reviewers for helpfull comments on an earlier version of this paper.